A nice bonus in most group breaks is an extra, random team in addition to your selected team. I picked the Rockies, no surprises there. And I believe I have the Mets in Nachos Grande's current break, but in Trevor's midsummer break at Bump and Run Football Card Blog, I ended up with the Pirates. No problems with that; in fact if I had to rank favorite teams, they'd probably be up in the top ten or twelve. They usually have some pretty interesting characters, and a rich but often overlooked history going all the way back to Honus Wagner. My Topps Opening Day blaster in 2017 was filled with Pirates, and I had fun with that post. Gregory Polanco also seems to be having plenty of fun on his 2018 Stadium Club card, flashing a couple peace signs at the camera. This is a view few of us get, a shot looking up the dugout steps that's usually reserved for players. The piercing gaze of cameras look down the dugout regularly, and sometimes even into the clubhouse tunnel, but very rarely out onto the field from this perspective. The full-bleed design lets us see the stadium lights turned on against a rapidly approaching dusk. 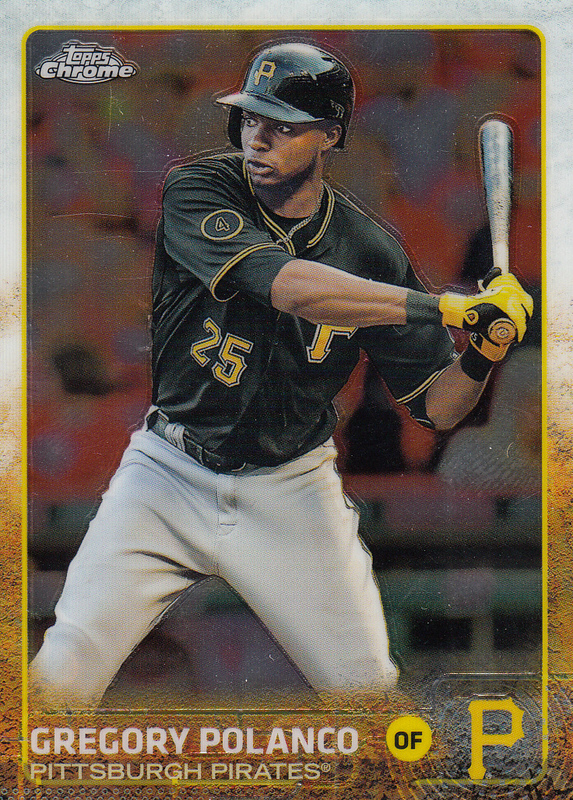 A fun fact on the back tells us that Polanco was the first-ever opening day DH for the Pirates, meaning they must have opened the 2017 season on the road for an interleague game. Sure enough, they opened last year in Fenway Park, and took a loss to this year's AL pennant winners. 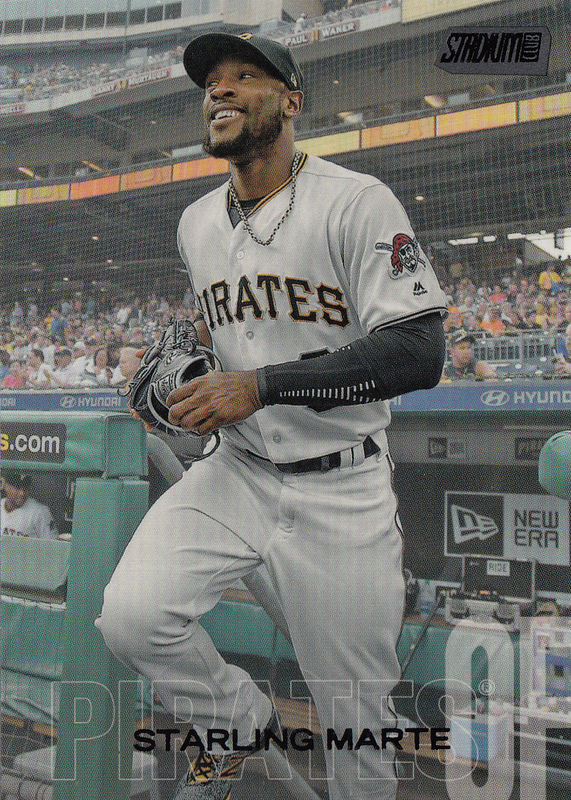 A more commonly-seen view of the dugout greets us on Starling Marte's card, which is a Black Foil parallel. It doesn't pop quite as well as the Red Foil variety, but it's nice to get a look at the various colors to be found in 2018 Stadium Club. I can't say I know much about Polanco or Marte, but they're both from the Dominican Republic. Santo Domingo, to be exact, which is the birthplace of a slew of famous ballplayers, including David Ortiz, Pedro Martinez, Albert Pujols, Jose Bautista, and many, many others. It's a pretty small country, but they've sent a significant share of famous ballplayers to the MLB. Same goes for the state of Oklahoma. Hailing from that midwestern state are Johnny Bench, Mickey Mantle, Joe Carter, Willie Stargell, and Paul Waner, a Hall of Famer and the 1927 NL MVP. The Pirates won the pennant that year, but ended up with the misfortune of facing the 1927 Yankees, arguably the best baseball team of all time. It was the only postseason appearance of Waner's career, and his Pirates were swept by those invincible Yankees. Those of you who read my previous post will notice that this is a new design, as I didn't get any Rockies from the box of 2018 Diamond Kings. That was more than offset by a case hit of Jon Gray (also from Oklahoma), but the box gave up a few treasures for the Pirates stack. The set has that same playing card finish I've pointed out in past years, and a similar oil painting look as you've seen before. 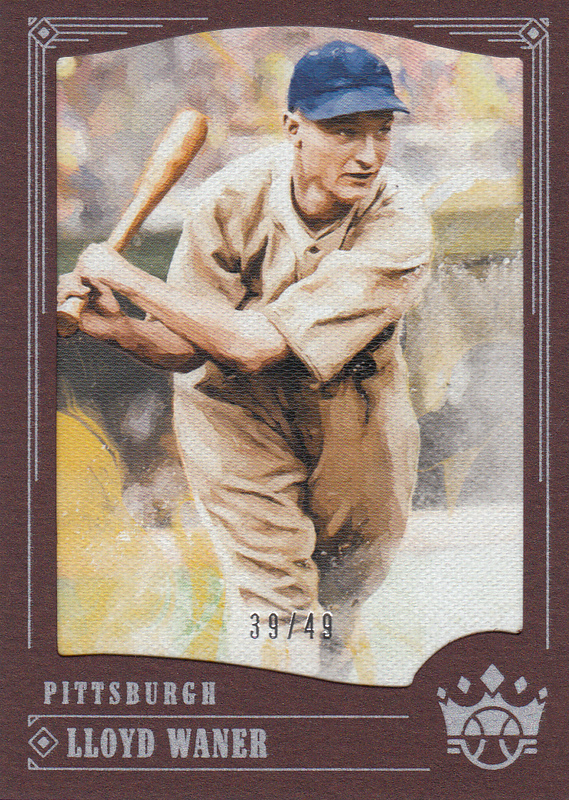 The white-on-yellow text is a touch hard to read, but the back of the card tells us that Waner made the most of growing up on a farm. He honed his craft learning to hit corncobs with a stick, which apparently makes hitting a nice sphere with a thick bat a walk in the park. Of course, being in the Hall of Fame often leads a team to retire your number, and if you look closely on Marte's card, you'll see Waner's #11 on the facade of the third deck, just to the right of Marte's cap. The Pirates also brought Paul's younger brother Lloyd aboard, and they played together throughout the 1930s. Lloyd is also in the Hall of Fame, but didn't have quite the high performance as his older brother. And the Pirates #10 is still in circulation, currently worn by Jordy Mercer. Diamond Kings yielded a hit for me, balancing out the lack of my preferred team. This is a framed border parallel, the Brown version, which is numbered to just 49 copies. It's most likely a bit more plentiful than a Photographer's Proof in 2018 Stadium Club, but 49 is pretty darn scarce. I'm sure the Waner family back home in Oklahoma was delighted to have a couple pro ballplayers bringing home the bacon during the 1930s while the topsoil was blowing away in the midst of severe drought. 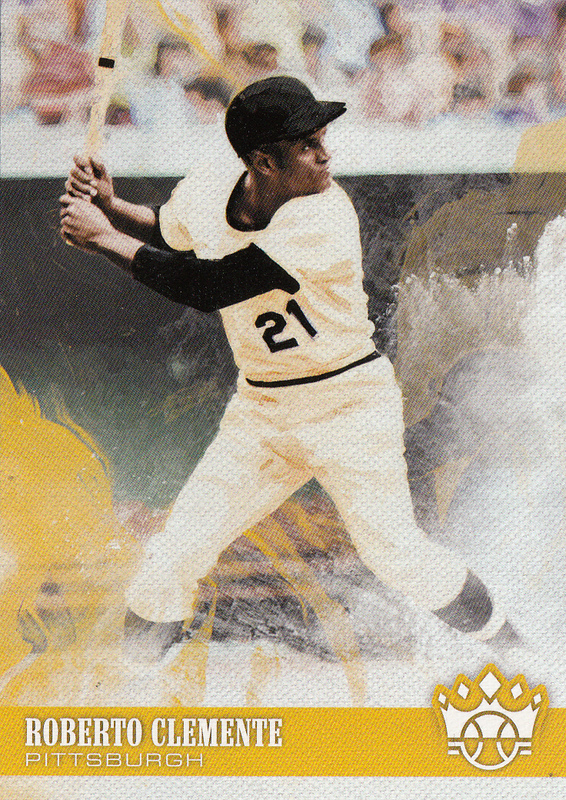 Moving a bit further down the Pirates timeline, we come to the great Roberto Clemente, Hall of Famer, MVP, 15-time All-Star, and two-time World Series champion. He's also in the 3,000 hit club with Paul Waner. As this is an unlicensed set, there can't be any MLB logos, but somehow that's a bit less noticeable on older photos. The blocky yellow "P" is pretty conspicuously absent from Clemente's batting helmet, the kind without ear flaps. But on the Waner cards, It's not clear how much image editing Panini had to do. 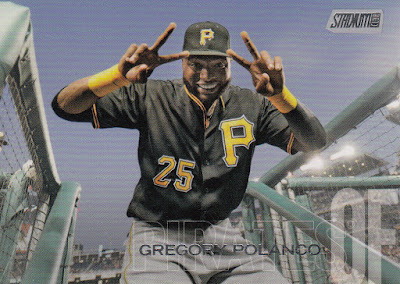 Gregory Polanco makes another appearance, but he's all business this time around, and with a degree more shininess. 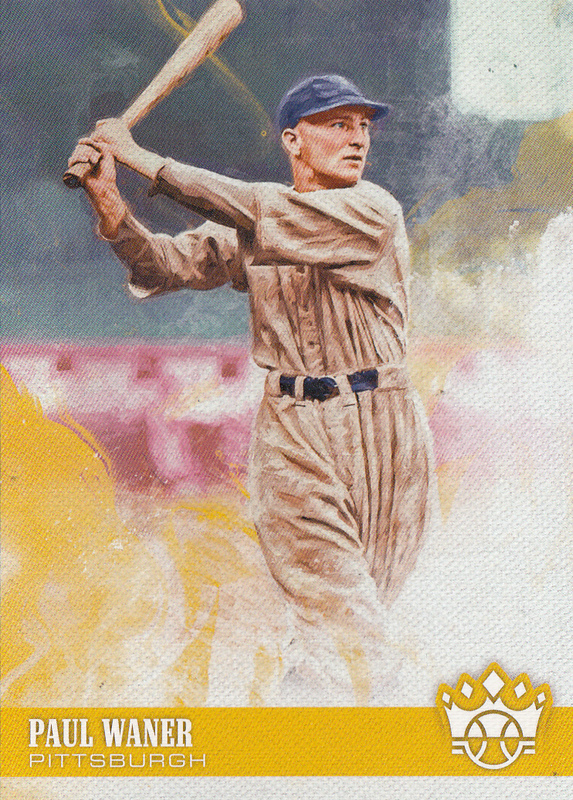 I don't hear much talk about Topps Chrome anymore, which maybe has something to do with the lack of borders in Topps flagship. But I'll always take a shiny card. I'm always partial to cards that show special patches on the player's sleeves. I kind of got hooked on that mini collection while hunting for cards for Highly Subjective and Completely Arbitrary. In 2014, the Pirates wore a #4 patch, memorializing Ralph Kiner. Kiner, yet another Hall of Famer, led the NL in home runs for his first seven years. He only played ten seasons, retiring at just 32 due to a back injury. He stayed involved with baseball for the rest of his life, getting into broadcasting in the early 1960s, and he was the voice of the Mets right up until his death in 2014. Game 7 of the NLCS is drawing to a close as I write this, so I'll wrap things up with one for my Coors Field Frankenset, newly released onto the market by Topps this year. This happens to be a zero-year card, because while Daniel Nava is technically part of the Pirates organization, he hasn't appeared in a Major League game with them, let alone one at Coors Field. He's bounced around the big leagues since he left Boston in 2015, and it remains to be seen when his next appearance will be. That looks like Bud Black in the Rockies dugout, occupying his usual spot on the top step. 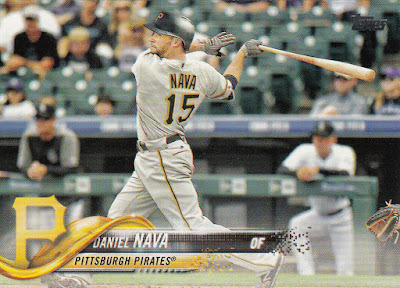 That would place this card in 2017 when Nava was a Phillie, narrowing this down to early August 2017 in an entirely different uniform. This has been my most prolific month of blogging since April, and it feels good to be writing again and giving proper thanks to the great members of the Cardsphere. Thanks for sticking around, and enjoy the World Series! I'll be trying to figure out which team I can tolerate more. 2018 Diamond Kings is a solid product. Just wish MLB would give them a license. I think there is a nice balance to be found somewhere between a monopoly and 53 sets a year from a half-dozen companies.